Mud season is here for many places in the Northern Hemisphere—the bracing and lovely ‘sprinter’ season (spring and winter) where massive snow dumps can occur right along side atmospheric rivers in the Pacific Northwest and eighties Fahrenheit near Phoenix, Arizona. Colorado prefers to put all those (minus the pouring rain) in a few days with a good dose of Nebraska-style blow-you-sideways winds. I can try out shoes in all four seasons in a few days! Luckily, this time around I was testing one of my long-time favorite shoes—the Salomon Speedcross 4 ($130). The Speedcross is a love-it-or-leave-it shoe for many people. So while I never like to see a favorite shoe of mine undergo changes, for the most part, I like the refinement they’ve done with this fourth rendition. I’ve had many, many pairs of Speedcross since the original one came out, and I’ve loved every one—they make me feel fast and relatively agile, and they handle a lot of difficult terrain well. Read on to see what I really like about the 4 and what might leave a bit to improve next time. The upper remains unchanged for the most part—same great toe bumper, mud-guard rand, textiles, and overlays. I found the shape and width to feel the same on my foot as prior models have in the same size (women’s 8.5)—it’s the snug, soccer-boot fit that leaves me just enough room to wiggle my toes, but not much extra. In all my other footwear, I seek out very roomy toeboxes, but for some reason, the Speedcross still works even for my Chaco-loving foot. The durable anti-debris mesh remains rather water resistant in the regular shoe, and there is a Speedcross 4 GTX as well as a Speedcross 4 CS (ClimaShield) option for those who prefer even more protection against the elements. I find the upper to truly excel at keeping debris out. Coupled with a pair of Dirty Girl gaiters, I’m always surprised at how clean my feet end up after a burly day in the mountains. For as good as the mesh is at keeping stuff out, it does tend to retain a bit of water after a few soakings in streams. It doesn’t end up bothering me or creating blisters, but if they could magically improve the drying rate of the shoe, I’d not be disappointed. I don’t find heat retention to be an issue for me with Speedcross in the summer, but I don’t live in the truly hot and humid environments that many do, so I’d be interested to hear your thoughts. The tongue is still not gusseted but is adeptly held in place by the thin ribbon that runs up the center of the tongue from distal to proximal, which also acts as another layer of protection for your foot from the Quicklaces. The lace garage is still on the end of the well-padded tongue and it’s perfectly placed to accept the laces after I cinch them. I find it just as easy to route the tail back under the far-end horizontal lace. I do love Salomon’s Quicklaces; I’ve never preferred any other brand’s version of the same concept. These are set-it-and-forget-it laces for me on this shoe and they neither tighten nor loosen during a run of any length. That’s pretty amazing to me. Lastly, Salomon points out that some changes were made to the heel collar and ankle notches of this fourth rendition, making them slightly lower profile but with improved padding. To be honest, I didn’t notice significant differences here compared to past versions I’ve owned. What I can say is that the ankle notches do not contact my lateral or medial malleoli at all in an uncomfortable manner. I’m thankful for this as it’s not true in all types of shoes. My Achilles is quite happy running up and down various types of inclines and declines in the Speedcross 4, which means the Achilles notch in the firm heel cup is also still thoughtfully well-designed. All in all, the changes here are subtle in my experience and certainly haven’t taken away at all from the Speedcross line. 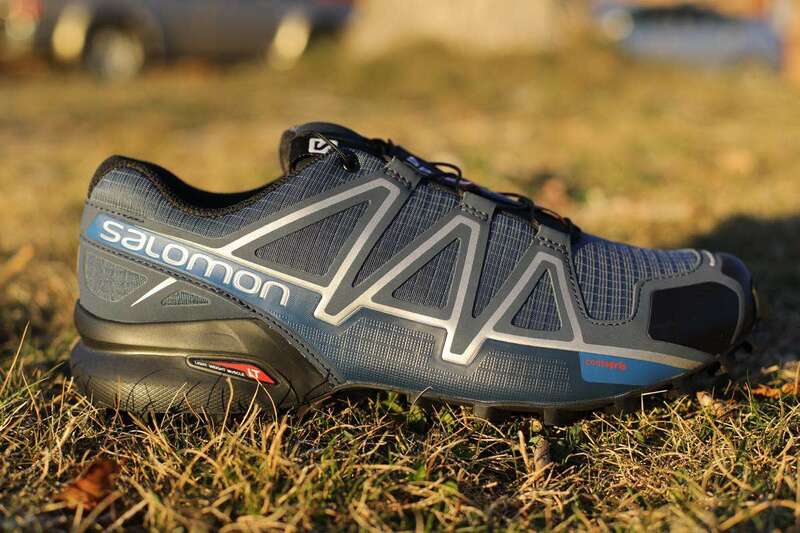 The Salomon Speedcross 4 lateral upper. No significant changes were made to the midsole of the Speedcross 4. Both molded and injected EVA are utilized to allow for relatively lightweight cushioning and stability. Salomon’s website has the weight at 300 grams and the stack height at 30mm in the heel and 20mm in the forefoot for a 10mm drop, which is in the same range as it’s been. Some other websites list the drop at 11mm, but I’ll go with the brand’s official listing to keep it consistent. This drop is definitely in my happy zone, and I really appreciate it as the miles rack up. The biggest challenge I have with the midsole is how thin the forefoot feels in the later miles of a technical 50k or a mountain 50 miler. I have long wished they would add a rock film (or even a thin rock plate) to the forefoot for a bit more protection in between the lugs, but so much else is right about the shoe, it hasn’t stopped me from wearing them. The other point of difficulty for some people I know, is the overall height of the shoe. At 30mm/20mm, you’re up off the ground a ways compared to other shoes in the same category, which causes some tipping and rolling of ankles for those who prefer a lower-to-the-ground shoe. I haven’t had any issues with that myself and still favor the protection and traction offered from midsole and outsole they’ve chosen a good portion of the time. The OrthoLite insole is again included, which I love because of the added cushioning and arch support it provides. The foam includes recycled-tire content, which is a nice nod to the environment, and it’s amazingly durable over the miles. I find that it fits very securely within the shoe no matter the weather and conditions I run in. It’s always dry by the next day’s run even if the prior run was several hours in the snow. The EVA heel cup on the sock liner helps support my heel a bit better in the Speedcross 4 and adds a bit of cushioning around it, which certainly enhances comfort as the miles pile up. For my foot, this insole is one of the best, and I’ve taken it out and used in other shoes before to extend their wear. The Salomon Speedcross 4 medial upper. 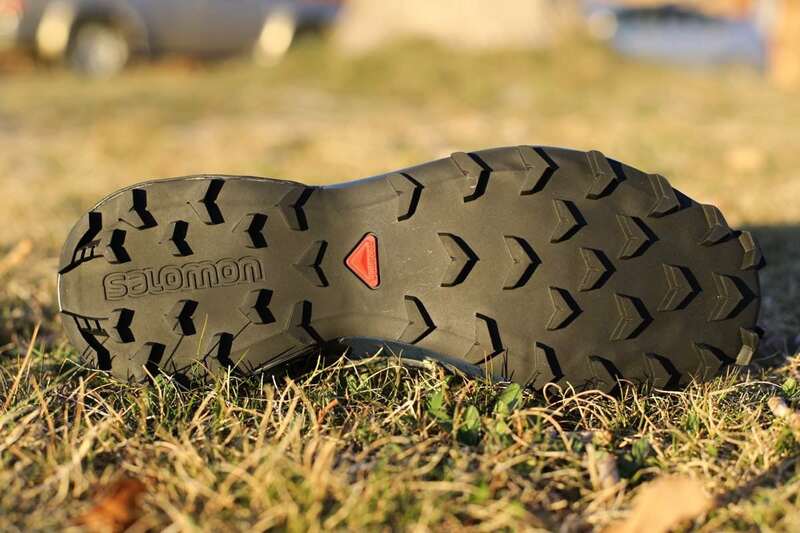 The outsole of the Salomon Speedcross 4 is upgraded to a more dense and durable version of the Premium Wet Traction Contagrip. The chevrons have the same appearance but are slightly smaller and placed with a higher density on the outsole. Gone are the half-chevrons that were around the outline of the sole, which should definitely lead to fewer ripped off outer lugs, an occasional complaint. I’m noticing very little wear on my outsole of the tester shoes after 125 miles, but more impressively, I’d been wearing a pair I’d bought several months prior in my regular shoe rotation, and again, the outsole has very little wear at 250-plus miles. It seems as if the increased density of the chevrons also is making the wear pattern more even so the shoe sits just as flat as ever against the ground. I’m excited to see how these hold up as summer Rocky Mountain running rolls around again. As a side note, when I lived in the Pacific Northwest, I felt like these shoes were genuinely even more in their element with the softer ground underfoot and the different types of debris. The traction these held over the sloppiest mud and undergrowth was impressive, and I can sincerely recommend to anyone living in wet, forested areas as well. As is typical of the Speedcross, the traction is amazing on all the technical surfaces I run. It’s overkill for gravel roads and smooth singletrack—there are plenty of other shoes out there for those surfaces. It’s the shoe I pull out for snow runs when I don’t quite need microspikes, and it’s one of the ones I most commonly wear for more rocky and rubbly trails in our mountains. It sheds all but the worst clay mud with ease, and I feel confident ascending and descending on trails with rocks of all types—talus, scree, doll heads, ball bearings—well, as confident as I could feel in my less-than-graceful downhilling. Some have noted that the traction on wet rocks leaves a little to be desired, but I’d say that’s true for me with all shoes. The Speedcross 4 is what I feel most confident in for such conditions at this point, but another brand or two is now coming in a very close second—a rising tide lifts all boats, do they say? All in all, the outsole of the Salomon Speedcross 4 is one of the best in the business for mountain running for me. 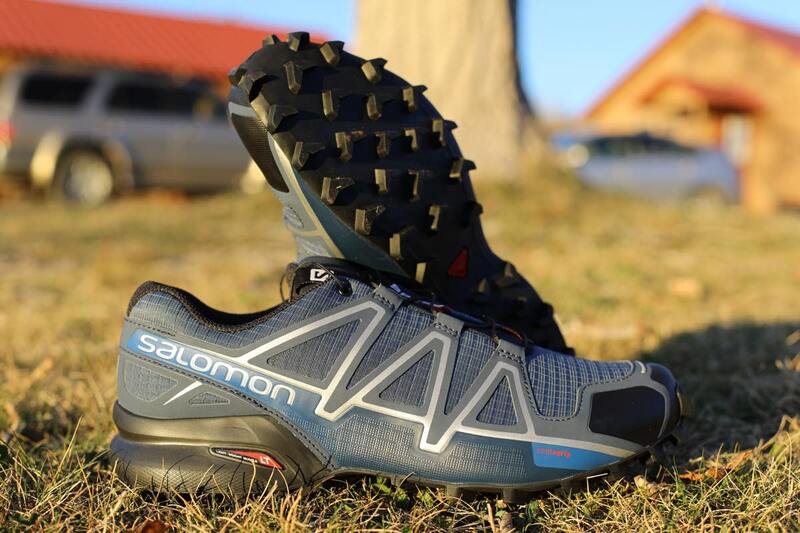 The Salomon Speedcross 4 outsole. The Salomon Speedcross 4 remains one of my favorite shoes for mountain running in most types of environments. For my feet, the Speedcross line is tested and proven over thousands of technical miles, and what shortcomings the shoe has, I know and understand and am able to work around. If you can tolerate the soccer-boot style of fit for the distances you’re doing on mountainous and technical terrain and don’t mind the higher profile, the Salomon Speedcross 4 is definitely worth a trial. Enjoy the agile responsiveness as you adventure through your favorite technical terrain! Are you a Salomon Speedcross wearer? If so what do you think of the changes and updates to version 4? Have they been improvements for you? 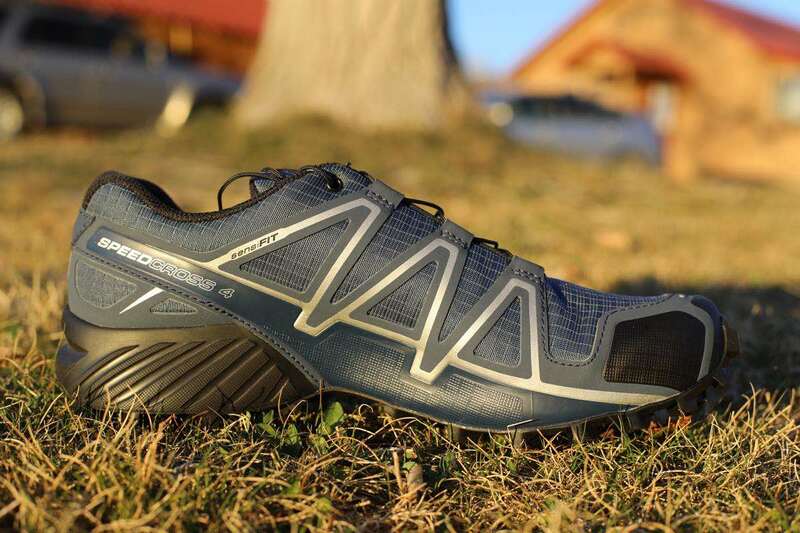 If you’re a Speedcross wearer, what features of the shoe do you most appreciate and what types of terrain do you think they travel best on? The Salomon Speedcross 4 view from the top. Did my first 50k in the rain with the Speedcross 4 and had a blast. The main advantage for me is the confidence you have that you will not slip on a muddy trail. I’ve seen runners fall and get injured wearing the wrong shoes. I think the issue is even more noticeable here in the Los Angeles area because we have been getting serious rain for only 2 weeks a year, so most runners are not prepared. We just run in dust and rocks pretty much all the time. You can easily avoid hurting yourself and actually have a blast in the wet with the Salomons. I had a lot of fun going around other runners in the downhills at full speed. For me the only issue is that your foot is higher up, but I guess it’s not an option looking at these badass 6mm lugs. You just need to get used to it. Thank you Kristin, I think your review covers pretty much everything! Didn’t these come out a couple of years ago? They came out in August 2017 and, if history holds up, the Speedcross 4 will be in the lineup for a long while to come. Just another thought: it would be awesome for fairly new trail runners or just runners new to muddy trails to list most of the shoes available in the US and Canada that have some of these big lugs. Before the Speedcross I tried the Altra King MT after seeing an ad, but I had to return them because my feet were hurting on sections with pebbles. Most likely because the undersole of the King MT is too thin. I think other brands like Scott, Salming or Inov-8 offer similar shoes to the Speedcross 4. I am only in trail running for a few hours every week, so I don’t have enough knowledge, but if someone can compile them roughly under this category it could be useful as a start point for many I think. This is an interesting idea for compiling a list of shoes based on outsole/lug depth. I’d certainly consider it. In the meantime though, Bryon’s list of new and interesting shoes coming out each season is a great place to start and skim. Enjoy your trail hours each week!!! I loved my Speedcross 3’s. Since the 4’s came out I’ve struggled with foot and ankle injuries. Not sure what the issue is but I’ve had to look at other options since this model came out. Very disappointing. I’ve put thousands of miles on both the dusty, rocky trails of Australia and the wet, muddy trails of the UK on to several pairs of Speedcross 3 and 4 shoes and they have never let me down. No great difference for me with v4 other than the more robust tread pattern. Keep them off the road, though. All that said, I still love the shoes. They are extremely comfortable and as they wear out, I take them out of the trail running rotation and move them into the landscaping shoe rotation. Of course every experience is anecdotal, but I had been wearing Hokas for several years. 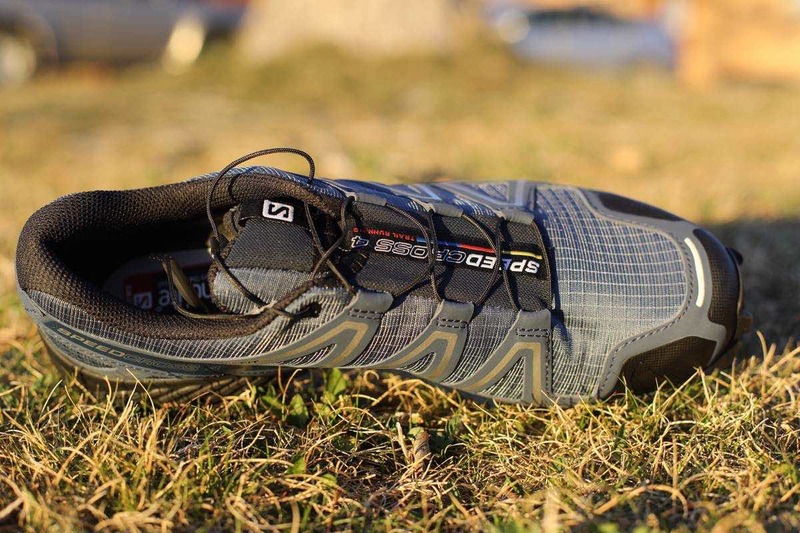 The latest versions of the trail shoes have hurt my feet, and then I tried the Speedcross. I had avoided them because I thought the sole wouldn’t work out for long runs. I was so wrong. These are the best shoes I’ve had in recent years. You guys are lucky to have narrow feet. All Salomon shoes are too narrow for me! I’m on my second pair of Speedcross 3’s, relatively new to ultrarunning, but I have to say it is an amazing shoe. I have a wide toe splay and like a commodious toebox, but my feet never feel cramped in the Speedcross despite its narrowness. Must be the soccer boot fitting. The lugs hold on to rock, sand and mud like nobody’s business. The shoe feels very light but cushioned at he same time, and I don’t feel the grinding on the metatarsals that sometimes comes with road shoes. And the clincher is of course the cinch-’em-and- forget-’em laces, as I just detest laces that come apart while running. I will try the 4’s when these go to their reward. I’ve had the Speedcross 4’s for a while now and I really love the shoes. I can totally relate to that soccer-shoe-style fit as they seem to hug my feet. No blisters or other issues. But I do have one question. I’ve read that others have had trouble with the insoles slipping when they get wet. I’ve not yet had to submerge the shoes or run in the rain or the wet, so I don’t know if I’ll have this problem or not. Have you experienced the insoles slipping and, if so, how did you resolve the issue? Thanks!